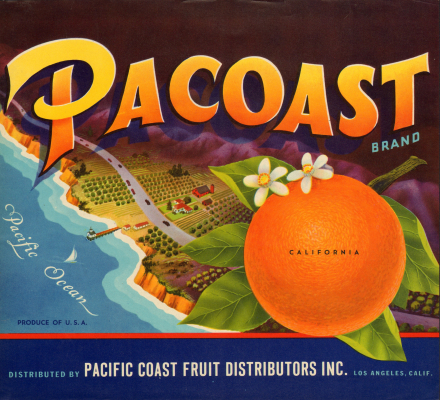 Almost any collector of Californian citrus crate labels will own the two “Pacoast” versions, one for oranges, the other for grapefruit, as they are absolutely common. I owe this discovery to Gielijn Escher, a well known Dutch poster artist and collector, former member of the Citrus Label Society. Please note the differences between the Californian and the Spanish label: Here the Pacific Ocean, there the Mediterranian Sea. 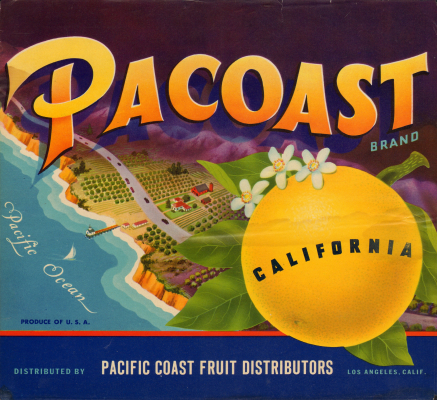 The Californian label shows only one farm with one orchard and one road with a little sea bridge and a sailing boat. 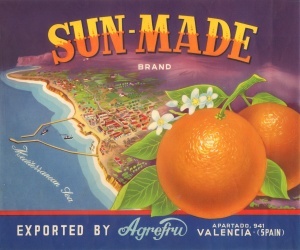 This situation apparantly did not seem adequate for the crowded coast of old Spain to the graphic artist. So he drew a much more developed coastal area, a veritable town with many buildings and streets and a harbor with two steamers. As we have a West coast in Pacoast we are looking from South to North. In contrast to this the coast near Valencia is an East coast. So we are looking from North to South on Sun-Made.